When you give you get! The adage that what you put “out there” comes back to you is true. In this case, we are talking about the simplicity of sharing your input (totally confidentially) in our 2016 Annual Salary Survey. 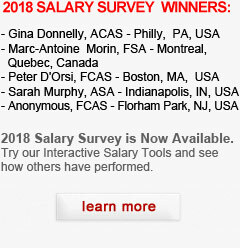 The more information we collect, the more valuable and complete the information we will be able to share with you about salary trends in the actuarial community. Our 2016 survey form just went live on our website. Time is limited to contribute. When you do, you earn a chance to win one of our prizes. Each year you contribute increases the number of chances you have to win. Each year the number of survey respondents grows. This is proof that the actuarial marketplace values the information we collect, chart and share with clients and candidates. It is our way of helping you access the information you need to make better career planning and hiring decisions. We attract responses from all over the world! Once collected, we organize the data and present it wrapped in our unique online query tools. You can use our tools to see how location, education, experience and area of expertise influence actuarial salaries. If you haven’t filled out the survey yet for this year, now is the time! You only have until January 31st. And don’t forget you will be eligible to win one of our prizes.